Well, I'm feeling almost like I'm back living on the Great Lakes again, what with all this spring rain. 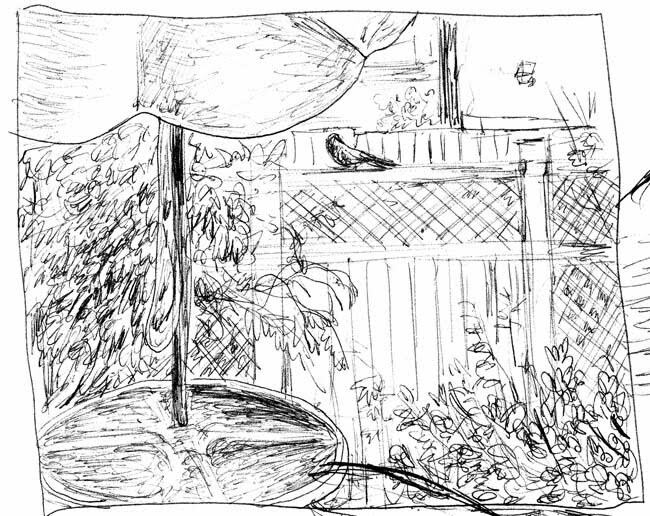 It was too wet to go to the park today so I sketched some of the large crowd of songbirds suddenly visiting our feeder again, after weeks of quiet. There are now three young oak titmice visiting. One of them spends extraordinary amounts of time at the feeder calling to mind the child who eats too much candy and ice cream. We now have a family of house sparrows coming around and there are some house finches courting around the black oil sunflower seeds. We had covered the carrot bed under the feeder and found that all the birds were clamoring to get in and clean out the fallen sunflower and millet seeds, so we took off the cover and they've been weeding voraciously, before the seeds ever sprout. The mourning doves never stopped coming around but seem more tolerant of the smaller birds. These birds are surprisingly predictable. Everyone visits morning, noon and night and they follow a fairly rigid progression. 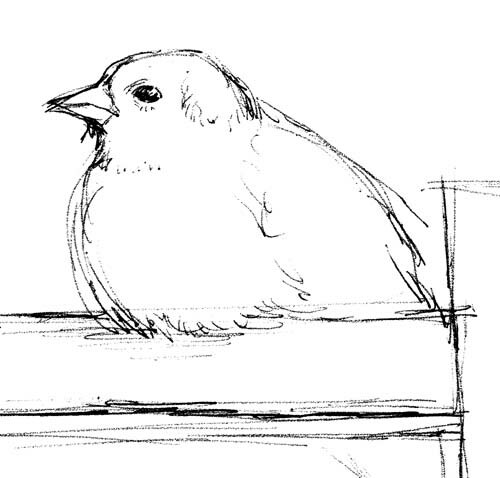 First the titmice, then the house finches, then the house sparrows. The mourning doves come along next and then a pair of pigeons. At the very end are the scrub jays, who seem a bit more relaxed now that their offspring has fledged. Although most of the birds will feed with each other, all of the songbirds scatter when the jays come around, not surprisingly, given their murderous behavior. 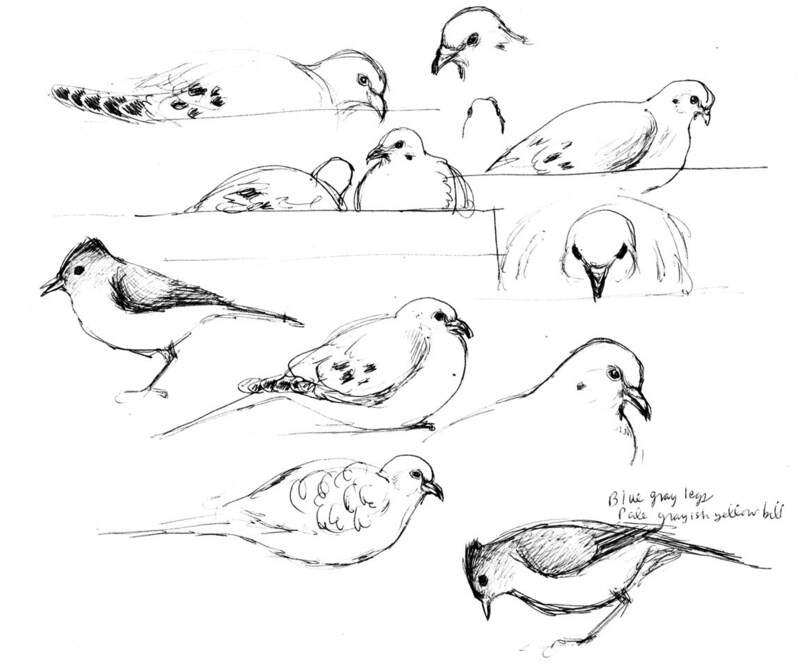 The mourning doves seem unfazed by the jays and usually remain on the feeder, preening then dozing. 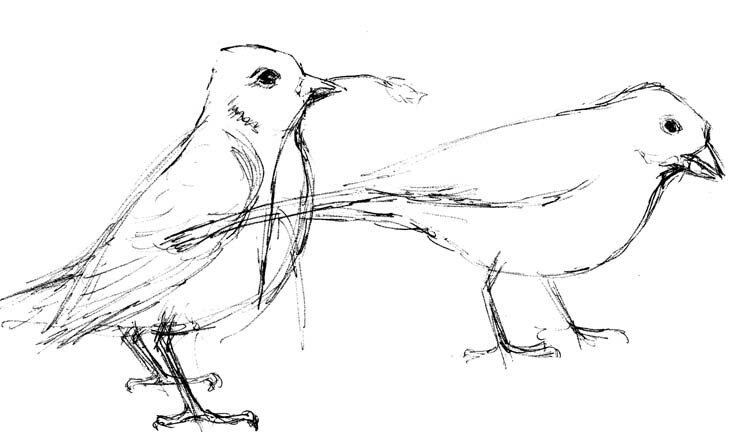 Now that I know what to look for I'm seeing fledging songbirds just about everywhere, including my own front yard where a pair of Oak titmice (Baeolophus inornatus) have been bringing their two offspring for fast food at the feeder. 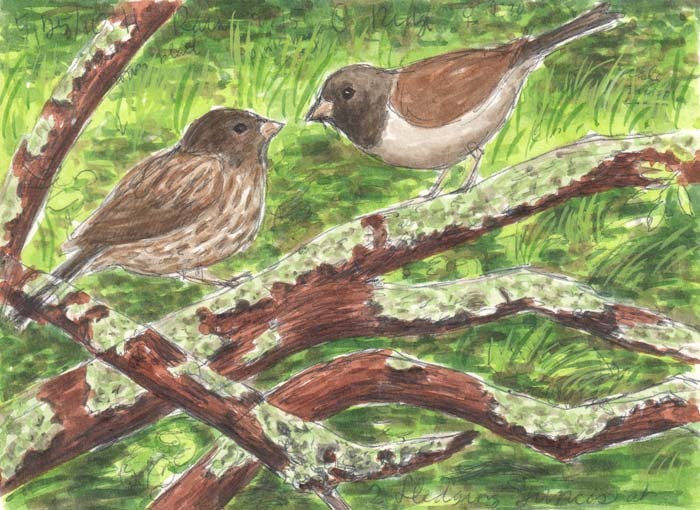 At Howarth Park I spotted two young dark-eyed juncos (Junco hyemalis) wandering about the underbrush and watched the mother come and feed one of them. A little farther along the trail an Oak titmouse fluttered it's wings and whined (bird style) repeatedly from a low branch until one of it's parents brought some food and stuffed it in. 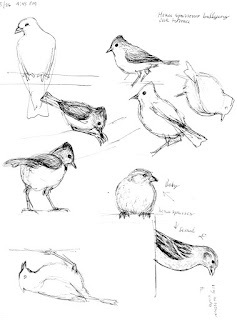 And the day before a wild gang of oak titmouse youngsters careened around in some oaks while I ate lunch and sketched. One was apparently as curious about me as I was about her and landed in a manzanita shrub about four feet away from me, checking me out carefully before zooming crazily back to the rest of the birds. In the same area, a group of White-breasted nuthatches roamed through blue oak and when they left there was one young bird still sitting, very still, on a branch high up for about ten minutes. The only time it moved was when a Turkey vulture (Cathartes aura) flew over, causing the nuthatch to slither (that's the only way I can describe the apparently effortless movement) to the lower surface of the branch, until the vulture had passed. Several minutes later the nuthatch walked up to the higher part of the tree and I lost track of it. This strange and rather prehistoric-looking tree stands in a park in downtown Santa Rosa. It's a Monkey Puzzle tree (Auracaria araucana), native to Chile, where it's the national tree, and Argentina. I discovered, the first time I saw the tree, that the leaves must be handled with great care or their stiff, sharp points will stab you painfully. According to Wikipedia the seeds are edible, so I'll be sure to try some when the cones fall. In the name of science, of course! It takes thirty to forty years for a Monkey Puzzle to begin producing seeds and the tree can live as long as a thousand years. I've found three others in this county and have wanted to sketch one for a while. I was in the park enjoying an iced latte on a beautiful Sunday afternoon and decided to give it a try. I think I'll have to come back with some bigger paper and color sometime. In the meantime, you can find out more about Monkey puzzle trees at Wikipedia and in an article by Dr. T. Ombrello of the Union County College biology department in New Jersey. 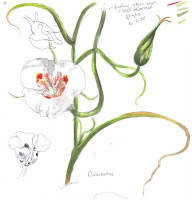 We have a lovely family of wildflowers in California, called Calochortus or mariposa lilies. They're also found further east, to Nebraska, south to Guatemala and north to British Columbia. But twenty-eight of them bloom in California. Our local native plant society sells a few (legally obtained) bulbs each fall and I was excited to try growing them in my yard. Although Calochortus tolerate poor soil they can't compete with the alien weeds that grow prolifically in my garden. 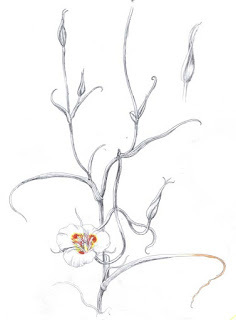 I didn't keep up with the weeding and, after the second year, lost six Calochortus luteus. The next year I planted in pots and had some success. I also added a different variety, Calochortus venustus, which seems to be a bit more tolerant of my garden and the squirrel that repeatedly digs around in the pot. It threw it's first bloom last week and I made some sketches. Now the Calochortus luteus, which is the species that I see growing naturally in my area, has begun blooming in Foothill Regional Park. 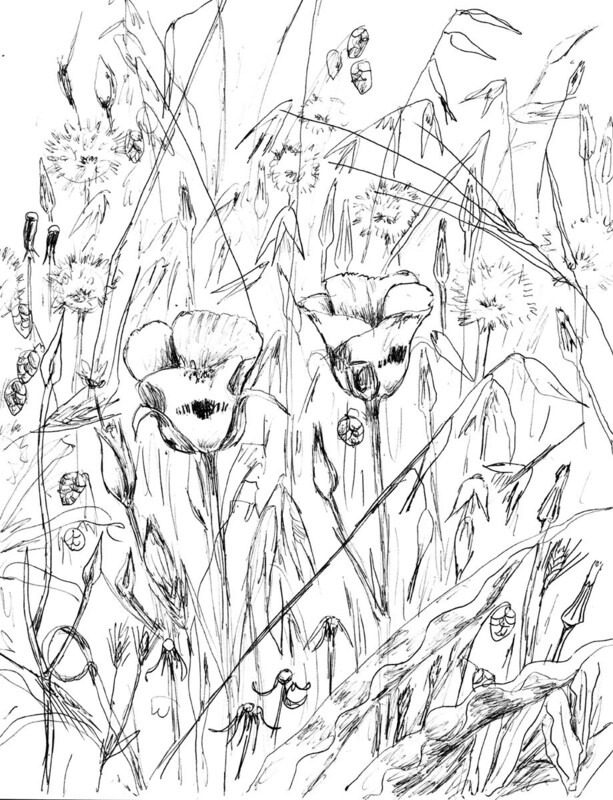 The first sketch is C. luteus which is a bright yellow and which I hope to paint in color before the bloom ends! Drawing from life and trying to get it right. Sigh. 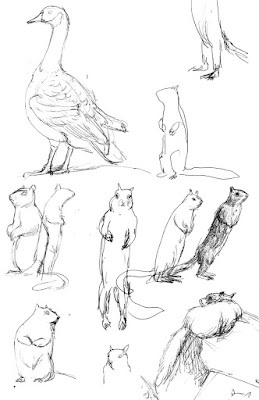 After many years of drawing from photographic reference material, I've sworn off the stuff and am learning to gather my visual information from life only. Easier said than done! Plants and fungi hold obligingly still while one draws them, but birds and mammals seem to be in constant motion. I try to look and memorize and then, as I start to draw, realize that I can hardly remember a thing. It's very frustrating. Trying to learn this new skill has brought up troubling memories of being very young and learning to ride a bicycle. I persist because I actually did...eventually...learn to ride that bike. Although I see dark-eyed juncos of the Oregon race frequently I haven't done any sketches of them before, because they tend to dart away as soon as I point my binoculars in their direction. Today, though, as I sat on the dusty shores of Pond B at Foothill Regional Park in Windsor, CA, I was pleasantly surprised to find one bathing nearby. She bathed once, left, then came back and bathed some more. Her bathing style was fairly sedate. The California towhees that use our birdbath at home bathe with complete abandon and much flapping and splashing. This junco got in the water, jiggled about a few times, sat there quietly then left. 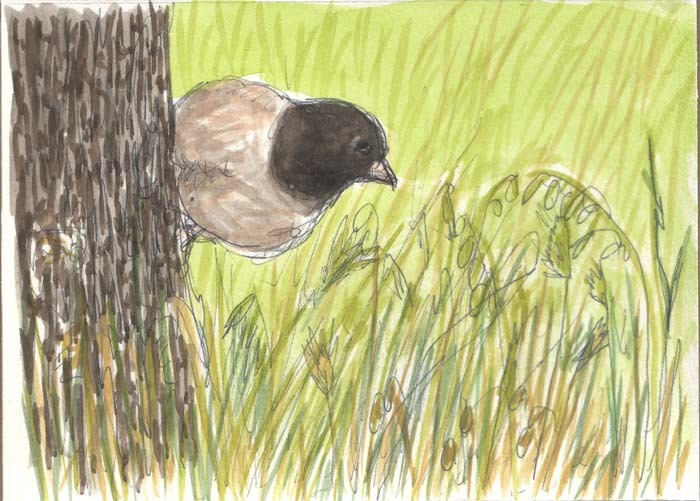 When she was done she went off into some nearby grasses and preened then rested. Without binoculars it was impossible to spot her but, hey, she was holding still! She stayed put until someone walked on a trail about a foot from where she rested and then flew off into some manzanita nearby. I didn't add color to these sketches until I got home. 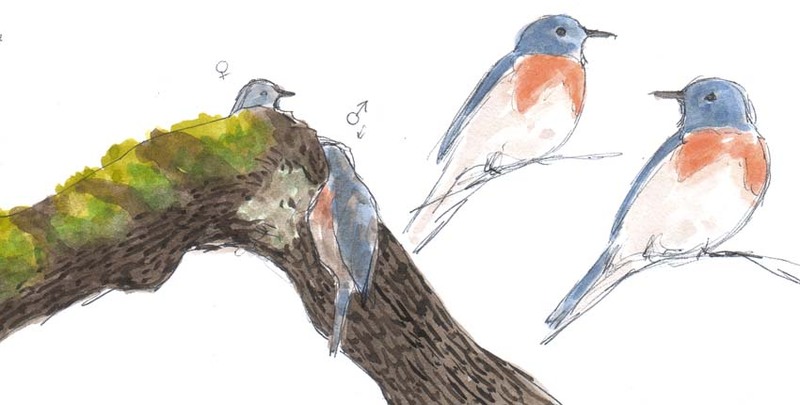 Once I started painting I thought I would consult David Sibley's Guide to Birds to make sure I got the colors right. Which led to me getting the color wrong because the juncos I've been seeing have so little of the rusty brown on their flanks that it's almost invisible. Note to self: trust your own memory and just hold off on the painting until you can go back and confirm what you thought you saw or didn't see. The other day I was surprised to find birds singing loudly all over Howarth Park. It's been fairly quiet the past few weeks. I was even more surprised by two different juncos that flew toward me when I spotted them, scolding and flitting from branch to branch, appearing to do the junco version of getting in my face. 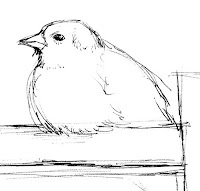 In the past few weeks, whenever I've stopped to look at a junco they're gone before I've raised my binoculars. 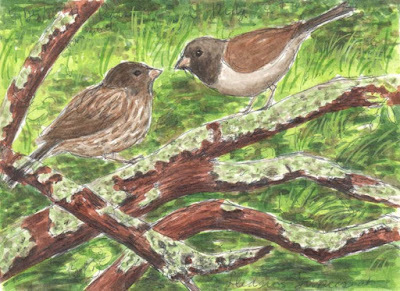 Because I've noticed a few other avian young are fledging it occurred to me that the juncos might be, as well, and that these assertive juncos are watching out for their young. The bird I sketched below was perched in a prominent location and singing loudly, possibly defending his territory. 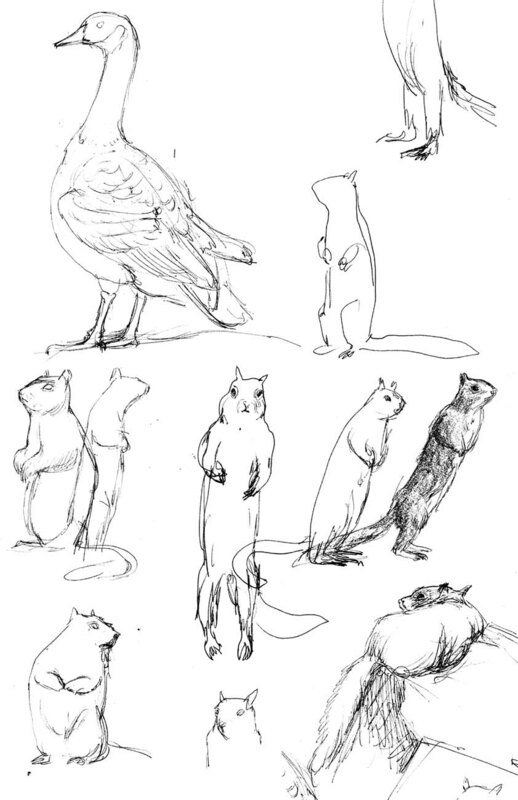 I spent a luxurious morning sketching at Howarth Park, stopping at Lake Ralphine for lunch and some ground squirrel antics to amuse both Chloe (my dog) and I. I sketched the goose while the ground squirrels were in hiding. The squirrel on hind feet was about 6 feet (1.8 meters) away and appeared to be considering whether I might be hiding food in my backpack and if it would be worth it to come closer to the dog to find out. She decided to keep her distance. Six days ago a pair of California towhees (Pipilo crissalis) built a nest in our backyard and lost their three eggs a week after being laid. I thought the culprits were rats but didn't know that there had been an avian dust-up the day they disappeared until my husband told me that there had been jays and towhees yelling loudly most of the morning. That points to our resident bully, a scrub jay that had already attacked and caused the death of a house finch this season and raided the towhee's nest last year in our rose trellis. Sunday May 9, the day the eggs disappeared, the industrious female began to build another nest, although not in our yard. We saw her several times, gathering nest material, in our front yard. A couple of days later I noticed her resting wearily in one of our garden boxes for a very short time, maybe 15 minutes, before getting back to work. 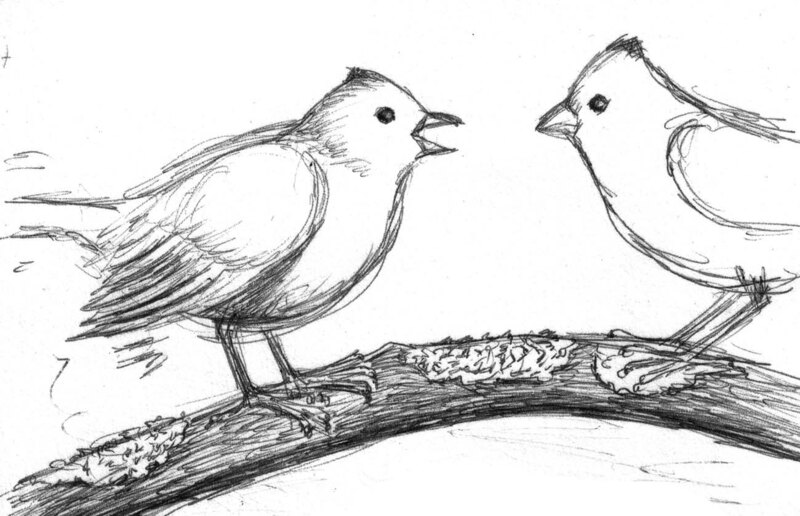 During the last week we often heard the two birds calling to one another and saw both birds at our feeders. 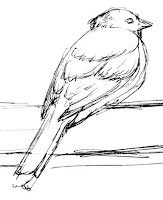 Sunday May 16 just before lunch I was sketching in the kitchen, by the window that looks out on our feeders, when I saw a scrub jay swoop down to the ground, heard two towhees call out in alarm and saw one of them fly off. I figured that the other one flew off in another direction and ate my lunch. After we'd eaten Greg went outside to water some seedlings but came right back in, obviously distressed. He asked me come outside and showed me a crow ripping apart a towhee in the street. We shooed the crow away but the towhee had already been divested of much of it's head. The crow came back and resumed the carnage. We were gone all afternoon but when we returned home Lumpy, as we called the male towhee (in reference to a large lump on the side of his head) was nowhere to be seen. Since he normally spent a great deal of time at the feeders we feared the worst. He had met with some kind of disaster before we noticed him and had been blind in one eye for a while and was missing a foot, making him an easy target for the scrub jay. 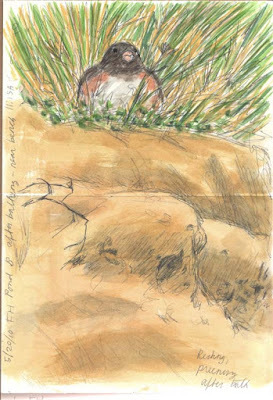 California towhees mate for life. The female builds the nest, sits on the eggs and depends on the male to feed her and to help feed the young once they've hatched. I've been unable to find information on single mom towhees but suspect that, if the scrub jay doesn't eat the eggs, they still don't stand much chance of surviving without the male to do his part. And, of course, with the female spending more time away from the nest, the scrub jay will have more chance to eat the eggs. Our front yard seems rather empty with Lumpy gone. He spent a good part of each day in our front yard, eating at the feeder, bathing in the bird bath and sunning on our front walk. 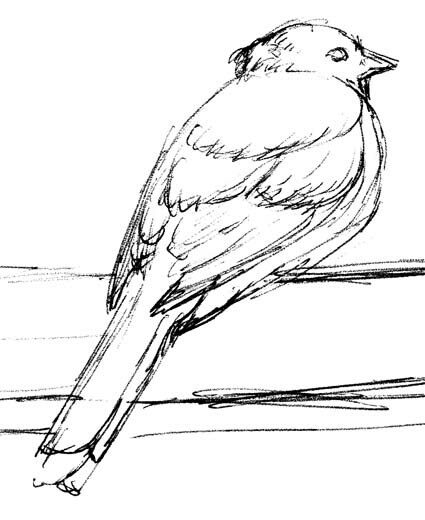 I sketched him several times as he was the least skittish of the birds that visit and I'm going to miss him. At this time of year it's usually sunny and warm here in Sonoma County. Yet we've been having some very wintry storms, usually on the weekends, the past few weeks. The weather forecasters said it wasn't supposed to rain until later in the day so I bundled up, grabbed an umbrella and headed for Howarth Park. The parking lot was nearly empty and most of the humans seemed to be traveling the paved trails rather than the dirt trails I favor. The wind blew and the bright green spring foliage glowed fluorescent against the changeable gray skies. Chloe and I got caught in one downpour and waited it out on a rock near an old quarry hole. 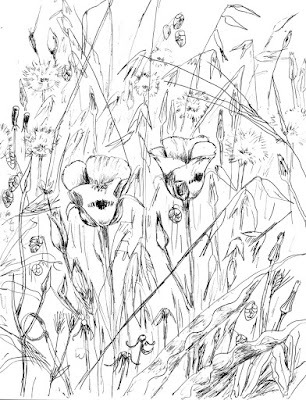 I drew some of the plants in the area; several grasses, wavy leafed soap plant, Dichelostemma, and a thistle. It reminded me of spring in upstate New York, the place I lived before moving to California. When the rain stopped we made our way to the lake where the geese had all hunkered down against the wind. I had to finish the sketch at home because my fingers got so cold I couldn't feel the pen I was holding. I went looking for Acorn woodpeckers the other day but they weren't there. 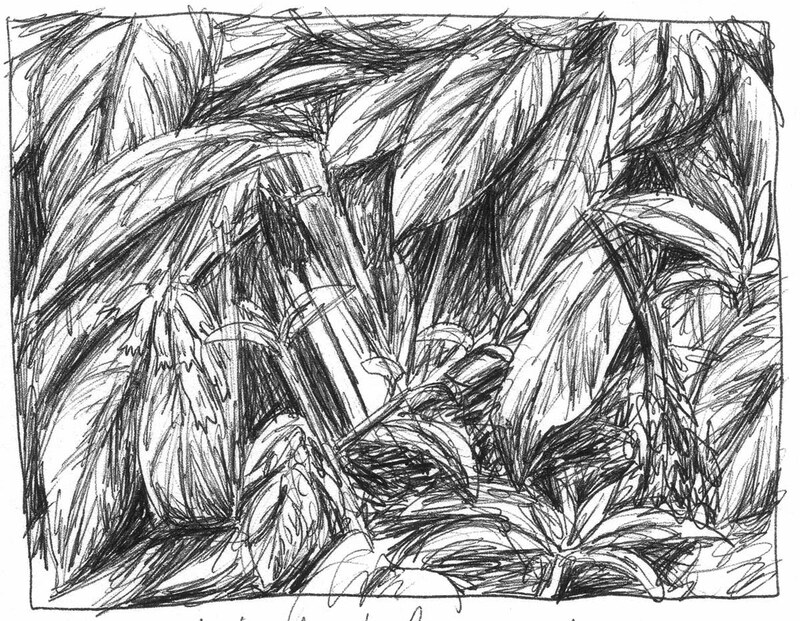 I thought I'd stay anyway and sketch some grasses and wildflowers while waiting to see if the woodpeckers decided to come and hang out a while. It was a beautiful spring day and I was daydreaming as I walked. Suddenly, the grass beside the trail I was on exploded as a giant bird gracelessly rocketed off the ground and into an oak where it tottered precariously before getting a good grip on the branch it had landed on. My heart pounding wildly, I raised my binoculars to see a turkey hen looking about as frightened as I was feeling. She stared. I stared. I got out my sketchbook. 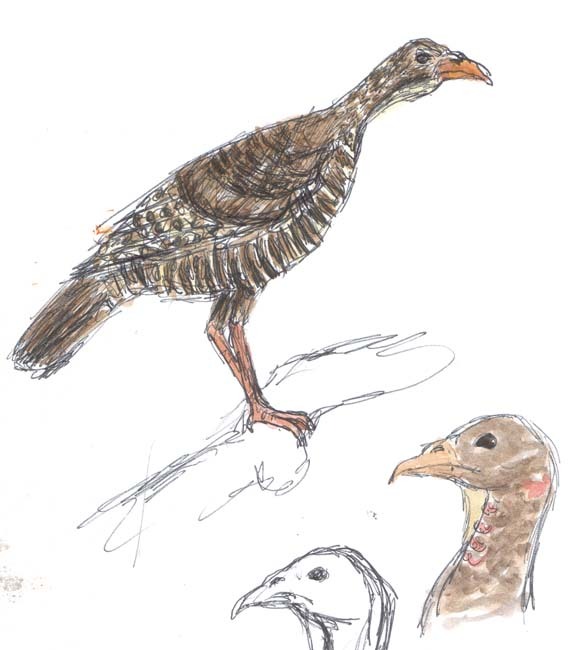 Usually, when I come across turkeys at Howarth Park, they're in flocks and they don't stick around long enough for me to unzip my backpack, let alone get out the sketch book. This one, traveling alone, stayed up in that tree for a good twenty minutes, giving me time to sketch and paint her. Then she careened crazily to the ground and disappeared in some more grass. The woodpeckers never did show up. Only a week ago I posted about, among other things, a pair of California (Pipilo crissalis) towhees that had nested in a shrub outside of my studio in our backyard. 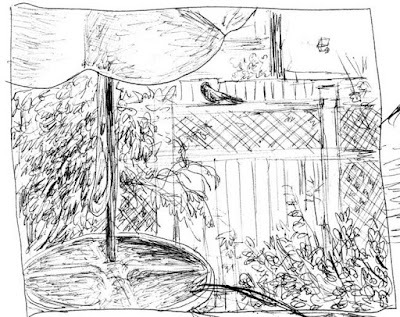 Greg and I were both excited at the prospect of being able to observe a towhee family raised in our backyard, especially since a scrub jay deprived us of the chance a year ago when she raided a nest that we watched towhees build in our rose trellis two years ago. We discovered her putting the final touches on the nest while sitting in the backyard last Sunday, May 2. 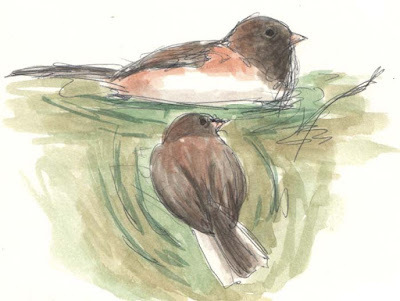 I heard the towhees calling to one another and saw her, with straw in her beak, disappear into the shrub. When she was gone I looked for and found the nest. The first egg appeared the next day and a day later Greg looked when she was gone and counted three eggs. For the next week she spent most of her time on the nest, although toward the end of the week she spent increasing amounts of time away. 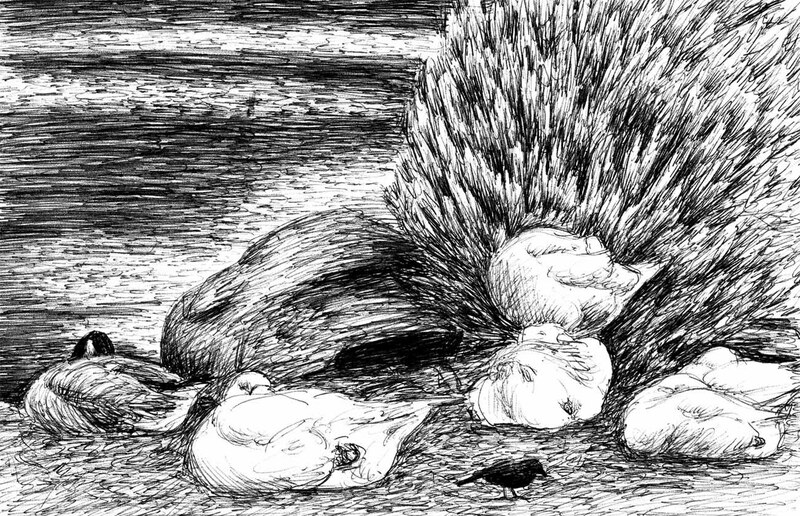 Each time she left the nest she announced it loudly to her mate, a habit I found convenient for me but I wondered who or what else might find it also convenient to know when there were unattended eggs. 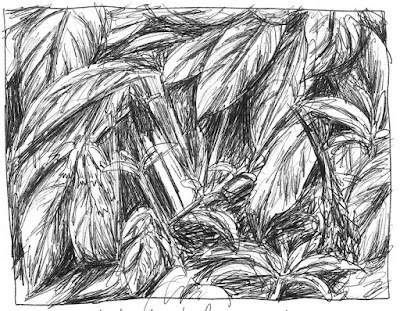 I remained hopeful, though, and planned to spend at least one of the days of the weekend parked in the backyard, watching and sketching. 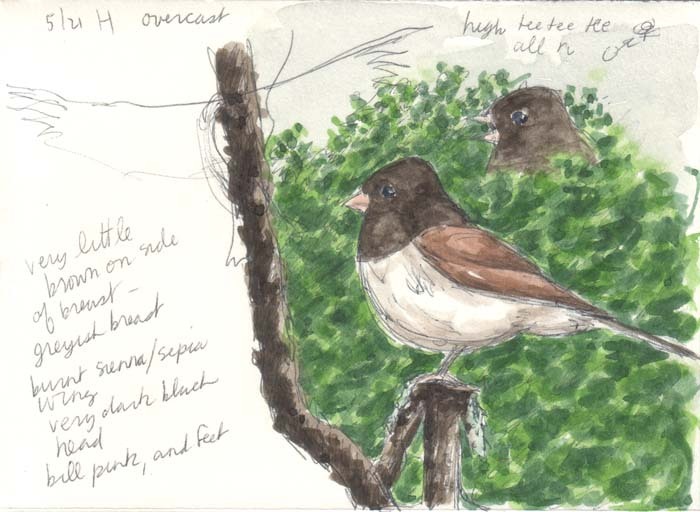 On Saturday, I managed to get a few sketches of the view I most often saw, a tail sticking up over the barely visible nest amidst a flurry of leaves and pink flowers. Sunday it rained, an odd event around here in May. The towhee, who had been spending more and more time away from the nest, left just as I was going into the house for lunch. 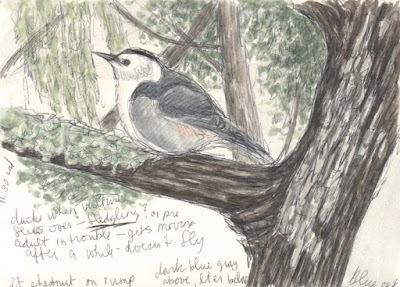 After I'd eaten I got out my sketching materials and sat under cover with my binoculars. No one was on the nest but I noticed our favorite towhee, Lumpy, lurking about the nest area and looking...well....anxious, if birds exhibit anxiety the same way humans do. Lumpy has a lump on the back of his head and only one foot and was blind in one eye for a while, although the eye seems to have healed. I thought Lumpy was a female and wondered, at first, if she was our nest builder. I watched for over two hours. Lumpy left off sitting on the fence above the nest only once when her mate called from the front yard. By this time, I felt pretty confident that she was a he. I checked the nest which was still unattended. It was too high for me to check the eggs but my growing sense of doom was confirmed when Greg (who's a foot taller than I am) got home and reported sadly that there were no eggs. We had worried about the location of the nest because the fence it's near wasn't private enough for our neighbor and, a few years ago, he built his own fence onto it, creating a partly hidden runway for the Norway rats that have become a large presence in our neighborhood as their favored habitats have been taken over by humans. We suspect that the eggs were easy picking for them, especially with the loud announcements each time mama towhee left the nest. Lumpy continued to sit forlornly on the fence until early evening Sunday and I concluded that he's the daddy. I heard them calling back and forth in the yard next to ours and they've both been seen at the front yard feeder. I hope they've found a safer place for their new nest. I hear them calling as I write this. Chloe and I walked for a long time on a beautiful day after several rather cold and rainy days. I wasn't quite ready to leave the park so we went to the picnic area at Lake Ralphine so that Chloe could look for ground squirrels and I could just look and see what there was to see. 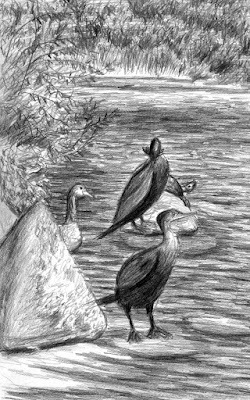 A Western Pond Turtle was sunning on a rock along with some Double-crested cormorants. Canada geese squabbled loudly and the few remaining mallard ducklings cruised by peeping loudly as they went. Two osprey circled overhead, hunting. The ground squirrels were conspicuous in their absence and Chloe was so focused on one of the the spots where they usually congregate that she missed a big fat Norway rat slinking along the edge of the water. The Bird Rescue Center called to tell us that the house finch that was attacked by a scrub jay, in our front yard, sustained a broken wing and had to be put to sleep. 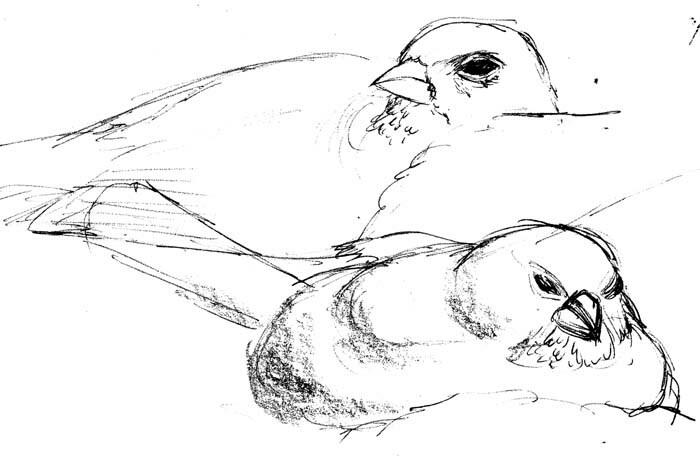 Last night I saw another pair of house finches courting on the feeder in the early evening. I don't know if the female was the same one, but the finch flock seems more relaxed than they were right after the attack. Only a few days later I found two nests. In the morning I noticed two Western bluebirds (Sialia mexicana) nesting in a Garry oak in Spring Lake today. 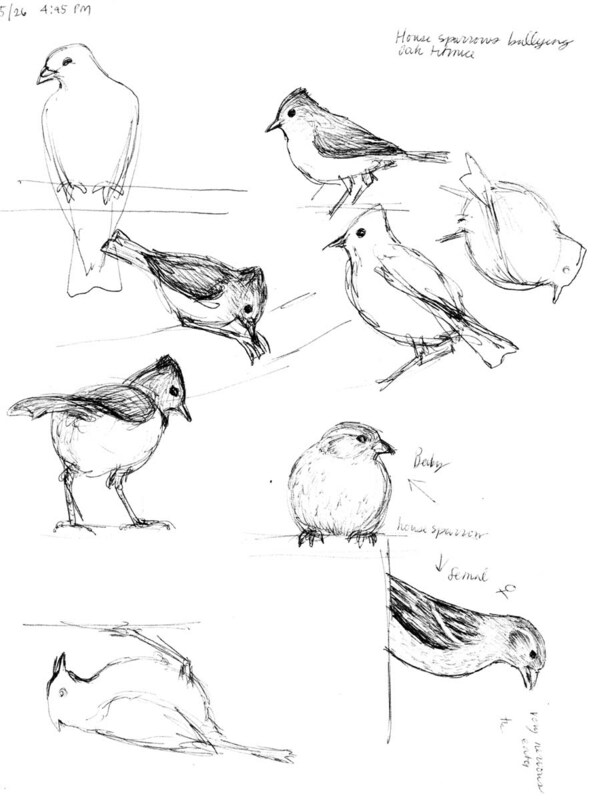 I did some quick sketches of the nest site and the male, because he was visible, which I colored later, and plan to go back for some more extended sessions. Later that same day Greg and I saw a California Towhee (Pipilo crissalis) carrying nest material into a shrub outside of my studio. When she left we looked for and found a nest. It's been a few days and, if the towhees are nesting in the shrub, they are very stealthy. I suspect that they've abandoned this nest and gone elsewhere. Oh! I just looked and an egg has appeared since last night!